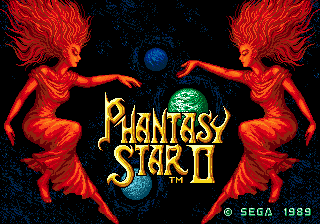 Phantasy Star, that’s a name that brings back an awful lot of fond memories for me. From the first Phantasy Star, with it’s 3D Dungeons, to the later games in the series, I’ve played em all. 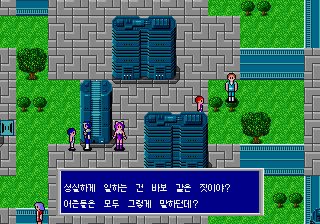 In fact, Phantasy Star 1 was my first exposure to console RPG’s. But enough of that, and back to the title I’m reviewing today. With the launch of the Genesis, Sega felt the time was right to release a sequel to one of their most successful Master System games…Phantasy Star. By taking most of the core gameplay in the original game minus the 3D dungeons, and combining it with new and improved elements, Sega was able to create a sequel that was just as good as the original…if not better. 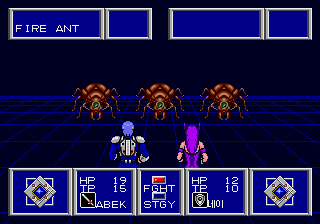 For it’s time, Phantasy Star 2 had no equal in story. And it was one of the first RPG’s that realized that a good story could add a lot to the overall experience. While the game doesn’t have huge amounts of dialouge of any form, what’s there definitely gives you a sense of urgency and importance.This game had more atmosphere than most games before or since. You didn’t just play the game, you were right there in Algol suffering along with the characters. The atmosphere coupled with what is, even to this day one of the best ending’s ever in an RPG secures this story a place in gaming history. Simple controls make this an easy game to just pick up and play. Gameplay-wise, this game doesn’t offer much out of the usual turn-based system used in console RPG’s since DragonQuest 1. You fight with weapons and spells, and use some items too. Yup, that’s about all there is to it. But still, the gameplay is far from bad. It’s just a shame that Sega didn’t think up the idea for Macros until PS4 came out, as this is one game that could’ve benefited from it. However, as it is…things are perfectly fine. Well, you better grab yourself a cold beer and find a comfortable chair, because this is one RPG that won’t go down without one hell of a fight. You better get used to limping out of dungeons with only one character alive, oh yeah…you might wanna get used to being totally wiped out as well. The monster’s won’t go easy on you, nor should they. This is an RPG the way it should be. Challenging, and frustrating as hell . Oh yeah, and let’s not forget dungeons you can ACTUALLY get lost in! There’s only a hand-full of oldschool RPG’s that are more of a pain. Ok, so no 3D Dungeons?! Well, who needs those stinkin 3D Dungeons, when you get sweet graphics otherwise!!! Ok, yes… the 3D Dungeons WERE badass, I agree. But, no use crying over spilled milk. These were still the best graphics seen in an RPG for the time. Well drawn monsters, with sweet animations that are even better than the one’s PS1 had in it. Extremely well done Anime Cut-scenes, and a pretty nice variety of scenery. Both in and out of Dungeons, there’s plenty to see. Catchy as hell music, and under-rated sound effects. No, a lot of the sounds aren’t “real” but they shouldn’t have to be. This IS a futuristic RPG after all, and everything suits that fine. I effing LOVE those sound effects. Being that it’s a fairly long and frustrating game, this wouldn’t be the type of game you’d be replaying right after the first time. However, this IS the type of game you WILL be replaying plenty of times over the years. This is a timeless classic, one you’ll come back to every so often…to relive the good old days. When Rpg’s were challenging, and characters weren’t sissy nancy-boy’s like Squall Pussyheart. This game comes VERY highly reccomended. Because anything less would be uncivilized. And, unlike that “RightGuard” crap… this game doesn’t need endorsement by Hulk Hogan or Charles Barkley. I’m an “Old Spice” man myself. Play this game or you’ll forever be mocked endlessly, until the end of time. 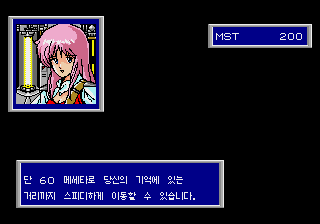 It’s a long waited translation for Phantasy Star 2. Patch it on USA/Europe version and the game’s ready to go!